The game map, showing only countries with non-generic focus trees. National focus trees serve as a replacement for the mixture of decisions and triggered events which directed countries in previous iterations of Hearts of Iron. The focus trees allow the players (and the AI) to direct the development of their nation. Each country has a focus tree, representing a number of progression paths (branches) available to that nation. These paths may be based on actual historical situations or on alternative historical possibilities. The individual options can range from political, diplomatic and warfare-related focuses to more economic and research-related focuses. Due to the semi-random nature of the AI it ensures that no two games will play out in precisely the same way. Players wishing to have a more historical-based campaign can choose to do so by ticking the Historical AI Focuses option on the country selection screen (map) just before the start of a new game. It is important to note, however, that player nations are not bound by this and as such their in-game actions can still force the AI to pick somewhat less than historical choices. The seven major countries have a unique national focus tree in the base game (Poland received a unique tree in a free DLC). Additional countries - as detailed below - received a unique tree as part of different DLCs. All other nations use the generic national focus tree. The Generic national focus tree has 5 different branches. Branches in a focus tree revolve around a common theme or goal with the individual focuses within intended to help in achieving that goal. Although branches are mostly isolated from each other, they will be connected (locally) if they happen to coincide over a common point. Political power) count towards the new focus. Motorized Infantry technology has already been researched beforehand. Once a focus has started, the player can't manually stop or replace it. If, due to circumstances, the focus has been invalidated, the resources already spent are lost. As such, it is immensely recommended to check all requirements and conditions regarding a focus to assess if/how they may be affected within its completion time-frame. Accessing a focus' expanded details can be achieved by clicking or hovering over the focus. Among the information presented there are: the flavor description, its requirements, bypass conditions (if applicable) and the expected completion effects. Bracket color - Players can check at a glance a focus' completion status by the background color of its name bracket. Grey bracket means available for picking, brown bracket indicates as of yet unavailability and golden bracket denotes completed focuses. On-going focuses will feature a shining overlay effect over them. Technology Sharing requires only one of the 2 preceding it. Technology Sharing (linked to both sides by an OR connection). A continuous focus is a special type of focus that is unlocked once 10 regular focuses have been completed. There are a total of 9 continuous focuses available. Having an active continuous focus comes at the expense of pursuing a regular focus as only one focus can be picked at a time regardless of its type. –1 Political power per day. The focus can,however, be deactivated or switched with another at any time for no additional cost. All nations lacking a unique national focus tree use the generic national focus tree instead. Note: The generic focus tree also acts as the default tree for nations which received a unique focus tree in a DLC if said DLC is not enabled. France, as one of the seven major powers, got a unique national focus tree. This branch offers the possibility to develop Metropolitan France and the overseas region, as well as two more research slots. This branch includes focuses which grant experience and research bonuses to improve in these domains. Germany, as one of the seven major powers, has a unique national focus tree. Germany's industry, adds a research slot, build fort lines around Europe and allows the creation of puppets. Germany's Airforce and speeds up creation of nuclear weapons and rockets. Japan. It leads to the Anschluss Sub-branch with more annexation and war options. Germany to annex several states, ally or declare war on several countries. Germany's Navy and befriends Scandinavian countries and Netherlands. Italy, as one of the seven major powers, gets a unique national focus tree. A smaller tree which focuses on industrial build up. The big naval strengthening tree. The big political and diplomatic tree, where you have lots of different choices on who to befriend and conquer. Japan, as one of the seven major powers, got a unique national focus tree. Fascist tree, it focuses around the aggressive conquest of China, Indochina, Indonesia and the Philippines and an alliance with Siam. Two Sub-branches that is used for both the Purge the Kodoha Faction Branch and the Support the Kodoha Faction Branch. It Increases economy law and allows Kamikaze Strikes. Japan's army while also giving it the Bicycle Infantry, a unique unit for Japan. Japan's Airforce and connects to both the Army and Naval branches. Japan's naval research and industry. Poland gets a unique national focus tree as part of a free DLC. This branch offers the possibility to develop the nation's infrastructure and factories as well as enabling up to two additional research slots. This branch has options to keep pace/modernize the Polish ground forces with/ahead of its neighbors. This branch includes focuses which grants several research bonuses to improve. First focus of the branch instantly expands state Capital's airport capacity (Danzig). This branch includes focuses which grants several research bonuses that could potentially specialize or widen the range of ships available for service soon. Includes research bonus for naval doctrine advancements. This branch contains various diplomatic focuses and focuses to change the ideology of the government. This branch has mutually exclusive choices that enables the player to forge an alliance or create one of its own. Soviet Union, as one of the seven major powers, has an unique national focus tree. Permanent Revolution / The Great Purge focuses on internal restructuring to unlock the full power of the Soviet Union. United Kingdom, as one of the seven major powers, has a unique national focus tree. Limited Rearmament branch gives bonuses to military research and builds air bases, factories and naval dockyards in the country. Reinforce the Empire branch reinforces and develops the Empire's holdings, gives wargoals, influences nations to lean to democracy, or allows you to hold the Imperial Conference, and if discussions go well with the Dominions, will allow the United Kingdom to unite the Empire through the Imperial Federation. Revisit Colonial Policy branch focuses on guiding all of your colonies and dominions to independence, and finally decolonizing the British Empire completely. Steady as She Goes branch gives you options to either prepare your homeland for the inevitable war or to abandon Chamberlain's policy of appeasement and tighten your grip against the other major powers. A Change in Course branch has 3 main alternate history paths, one to get Edward VIII to rule Great Britain directly with the King's Party, one to get Oswald Mosley and his British Union of Fascists in power with Organize the Blackshirts, and finally to become a Communist state with Concessions to the Trade Unions. This Branch mainly gives the the United States decisions that give attack and defense bonuses against certain countries. This Branch gives technology research boosts for the Army and the Airforce. Available only with the Together for Victory DLC enabled. Australia, along with other nations of the British commonwealth, gets a unique national focus tree as part of the Together for Victory expansion. Without the expansion, Australia utilizes the Generic national focus tree. Focuses on providing research bonuses for Land Doctrines, Infantry equipment, Support Companies and Armour. Focuses on improving the Air Force, including research bonuses for aircraft and air doctrines. Looks to upgrade the Australian Navy, focusing on ship and naval doctrine bonuses. Form a joint tree focusing on improving infrastructure and industrial capacity. Acts as a domestic politics tree, providing means to lift the country out of the Great Depression, and additional research slots. Keeps Australia within the Allies, providing access to Commonwealth technology sharing bonuses. Causes Australia to leave the Allies, giving further options to remain a Democracy, or to realign with either Fascist or Communist ideologies. British Raj's national focus tree. British Raj, along with other nations of the British commonwealth, got a unique national focus tree as part of the Together for Victory expansion). Without the expansion, the British Raj utilizes the Generic national focus tree. Focuses on gaining independence and modifies the debilitating national spirits of the British Raj. Focuses on expanding the army, establishes the air force and gives elite infantry divisions. Focuses on building infrastructure, naval dockyards, and gives extra research slots. Canada's unique NF tree (part of the Together for Victory expansion). Canada, along with other nations of the British commonwealth, gets a unique national focus tree as part of the Together for Victory expansion. Without the expansion, Canada utilizes the Generic national focus tree. A large, interwoven tree that serves to increase industrial capacity, resource availability and to lift the country out of the Great Depression. This first part of the tree is the most powerful, but most of it is locked behind War Bonds and Defense Regulations, which respectively require war and some world tension. 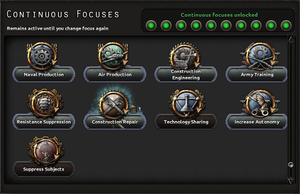 These focuses should be picked as they become available to start the industrial expansion. Another key focus is Commit to War, which is necessary for any conscription law above Volunteer Only and mitigates the Great Depression penalties. Finally, the Canadian player must choose between Send In the Zombies to significantly increase their manpower pool, or National Steel Car to unlock their full industrial potential. The ground forces branch. Focuses on research bonuses for infantry, armor, artillery and support divisions. Requires Send In the Zombies from the industrial tree for the last focus tiers. The historical path. Keeps Canada within the Allies, providing bonuses to Commonwealth technology sharing and other buffs to industry and resources. Canada severs ties with the United Kingdom, thereby allowing allowing Canada to leave the Allies. The first, democratic branch builds an alliance with the United States; the others are the fascist and communist paths. A notable option in the fascist branch is to bring Mexico over to fascism and mount a two-pronged invasion against the United States. Provides bonuses to radar, aircraft and air doctrine research. Focuses on the Canadian Navy, giving bonuses to ship model and naval doctrine research. New Zealand's unique NF tree (part of the Together for Victory expansion). New Zealand, along with other nations of the British commonwealth, gets a unique national focus tree (part of the Together for Victory expansion). Without the expansion New Zealand utilizes the Generic national focus tree. Acts as the political tree, providing both a means to deal with internal issues, and mutually exclusive branches on whether to remain within the Commonwealth, or to push for Independence as a Democratic, Fascist or Communist country. Focuses on developing a navy through construction of dockyards and bonuses to ship and naval doctrine research. Provides bonuses to aircraft and air doctrine research. Acts as the industrial tree, buffing industrial capacity, resource extraction and research slots. Focuses on bonuses for Infantry, Armour and Artillery, and construction of military industry capacity. South African national focus tree. Together for Victory expansion. Without the expansion South Africa utilizes the Generic national focus tree. national spirit, bolstering its army reserves available for muster, though it is mutually exclusive with another focus, Outlaw Strikes, which increases industrial output. The democratic path, this branch reinforces cooperation with the rest of the Commonwealth. Secure Interests in Africa, the final focus, can create Kenya and Zimbabwe as South African puppet states if the United Kingdom agrees to transfer its faraway possessions. The fascist path. This branch opens the possibility to switch to fascism immediately by starting a civil war. The player can go for greater cooperation with Germany, which comes with substantial benefits, or start a faction of its own, with a policy of revanche targeting the United Kingdom. In either case, former British king Edward VIII can be selected as the head of state. The communist path. One branch aligns South Africa with the Soviet Union. The other is the most unique of the focus tree, Anti-Colonialist Crusade: South Africa declares war on the colonial powers to liberate all of Africa from their rule. Provides bonuses to weapons, artillery and land doctrine research. Focuses on the Navy, giving bonuses to ship models and naval doctrine research. Available only with the Death or Dishonor DLC enabled. Death or Dishonor expansion. Without the expansion, Czechoslovakia utilizes the Generic national focus tree instead. Fortification Studies: This centers around land fortifications needed to successfully defend against German aggression. Note that some foci in this section set the fort level in provinces instead of adding extra forts. Building forts is not advised, as they will be overwritten when a new fort level is set. Industrial Legacy: This provides Czechoslovakia with additional factories and industrial bonuses. Political Direction: Here Czechoslovakia is given options for steering politics & diplomacy towards one of the major factions or a faction of its own. Strategy Decisions: These foci are similar to the political section but provide more interaction on cessions and research sharing. Soviet Union, gets a unique national focus tree as part of the Death or Dishonor expansion. Without the expansion, Hungary utilizes the Generic national focus tree instead. This branch allows Hungary to change its political stance. This branch allows Hungary to elect a Democratic, Fascist, or a Habsburg King and could potentially re-create the Austro-Hungarian Empire. This branch allows Hungary to become Fascist and create Greater Hungary and either join the Axis or create their own faction with Italy. This branch allows Hungary to become Communist and join the Comintern. This branch allows Hungary to develop its industry and unlock research slots. One of its sub-branches is connected to the Establish the Air-Force sub-branch. This branch allows Hungary to cast off the Treaty of Trianon and start researching military tech. This sub-branch allows the research and licensing of the Airforce. This sub-branch gives research bonuses for various types of Army equipment. This sub-branch deals with the Navy, but requires that Hungary controls a coastal state as they lack one in 1936. Soviet Union, gets a unique national focus tree as part of the Death or Dishonor expansion. Without the expansion, Romania utilizes the Generic national focus tree instead. Czechoslovakia. Unlike other focus trees, the separate ideologies in this tree is not mutually exclusive. Romania to develop its industry. To start this branch, one must start the "Preserve Greater Romania" or the "Balkans Dominance" Branch. This Branch handles the King and political ideology popularity. the ideologies are not mutually exclusive with each other. This branch allows the research and licensing of the airforce. This branch gives the player free division templates and a general as well as army research. This branch researches the navy. Soviet Union, gets a unique national focus tree as part of the Death or Dishonor expansion. Without the expansion, Yugoslavia utilizes the Generic national focus tree instead. Western Focus / Recognize the Soviet Union branch is the main political branch and the choice of what path the player wants to take, joining either of the main three factions. Industrialization Program branch builds up the country, gives resources and factories, improves infrastructure and gives the option of focusing more on the main Serbian provinces or improving the country equally. Modernize the Air Force branch improves the air force and builds military factories for aircraft production. The player can choose between producing their own aircraft or licensing foreign ones from other countries. Army Modernization branch expands the army and gives bonuses for army research. Expand the Shipyard branch expands the navy to better protect the homeland and gives bonuses for naval research. Available only with the Waking the Tiger DLC enabled. Waking the Tiger expansion. Without the expansion China utilizes the Generic national focus tree instead. Focuses on the internal social affairs of the nation and regional political relations. Focuses on military and fortification reform. Focuses on economic and technological build-up of the nation. Chinese minors that destroy or displace the Chinese national government gain access to additional focuses from the national tree, which may be necessary to unlock certain actions in the minor's focus tree or other options (e.g., offering citizenship to Alexander von Falkenhausen in order to recruit him as Chief of Army). Players of Chinese minors should review their own focus tree and that of Nationalist or Communist China when planning their game. People's Republic of China national focus tree. Waking the Tiger DLC. Without this DLC enabled, Communist China uses the Generic national focus tree instead. Nationalist China for supremacy, or go an independent path. Communist China to increase research slots, increase their popular support, and deal with External Politics. China, and increase military power. Communist China to ask Major Countries for industrial support. Communist China and the Chinese Warlords if they change their focus tree. Japan for independence, reclaim the Mandate of Heaven and restore the Qing Empire. Manchukuo to ask Major Countries for industrial support. It is shared with the other Chinese nations. Chinese Warlord national focus tree. Waking the Tiger DLC. Without the expansion the warlords use the Generic national focus tree instead. This branch begins the political focuses for the Warlords. Nationalist China. 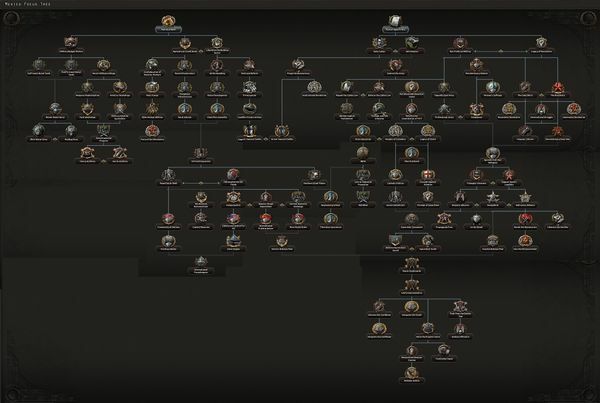 This will replace the current focus tree with the Chinese national focus tree. Communist China, The current focus tree will change into the Communist Chinese national focus tree and all Their national spirits will be yours. This is the Industrial branch of the focus tree. Available only with the Man the Guns DLC enabled. 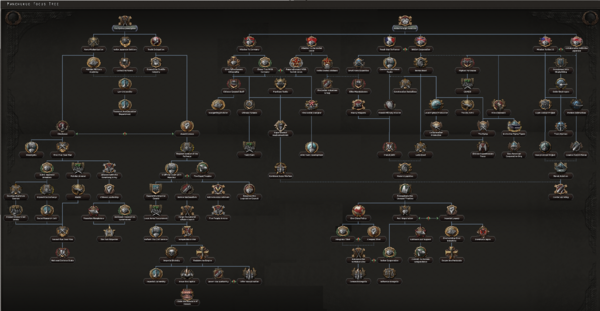 Mexico received a unique focus tree in Man the Guns. Unlike most other trees, Mexico's domestic and diplomatic options are widely varied - it's possible to implement some socialist measures and ally with the Church, or to become a traditional caudillo but join the Comintern. The many branches are also strongly intertwined, and may affect each other depending on the choices made on other branches. The main military branch, gives bonuses to equipment research and naval build-up. One of the mutually-exclusive economic branches, this one focuses on economic intervention and applying socialist measures to improve the economy. One of the mutually-exclusive economic branches, this one focuses on economic liberalization and applying liberal measures to improve the economy. This branch deals with both the military caudillos and the status of the Catholic Church within Mexico. From this branch it's possible to follow on either communist or fascist paths for Mexico, and embark on military adventures. Allows to build civilian and military factories across the Dutch colonial empire, and a special option to move the government to the East Indies should things go badly in the continent. This branch opens into two sub-branches: Continue the Public Works allows to build factories in Dutch soil and prepare against foreign invasion, while Overturn Military Budget Cuts gives many bonuses to equipment production. This is the main political/diplomatic branch, allowing the Netherlands to remain a pro-British democratic nation, to follow communism (either alone, with France or the Soviet Union), to restore the monarchy's long lost power, to become a pro-German fascist empire or to lay the seeds for an European Union.